Just want to share a pleasant news with all my friends. I have just published my next book at Amazon Kindle store. 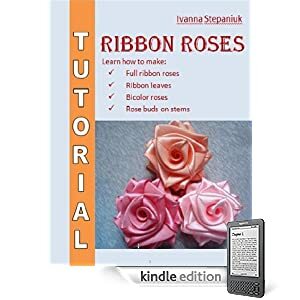 It is called "Fabric Flowers Tutorial", which actually deals with making ribbon flowers, roses in particular. Hope, it will have some success among the craft fans and Kindle owners. This paragraph gives clear idea for the new users of blogging, that actually how to do blogging. My partner and I absolutely love your blog and find nearly all of your post's to be exactly what I'm looking for. I wouldn't mind writing a post or elaborating on some of the subjects you write with regards to here. Again, awesome web log! my day. You cann't imagine just how much time I had spent for this information! Thanks! options out there that I'm totally overwhelmed .. Any ideas? Kudos! I found just ωhat I ωas having a look foг. You have ended my four day lengthy hunt! God Bless yοu man. type of info written in such an ideal way? I have a project that I am simply now running on, and I've been at the look out for such information. and wanted to say that I've really enjoyed browsing your blog posts. After all I will be subscribing to your feed and I hope you write again soon! the nail on the head. The problem is an issue that too few folks are speaking intelligently about. I'm very happy I stumbled across this in my hunt for something relating to this. Keep up the awesome works guys I've included you guys to our blogroll. a paid option? There are so many options out there that I'm completely overwhelmed .. Any tips? Appreciate it! you could write a litte more on this topic? I'd be very thankful if you could elaborate a little bit more. Many thanks! Congratulations on successfully publishing your new kindle book! im sure your family and friends must be very proud of you. enjoy the book and best of luck for the future! !